This page discusses how to calculate your team's offensive efficiency rating (OER) and defensive efficiency rating (DER). I got this information from Coach Chris Mack, former Xavier University Head Coach. Coach Mack says, "Two key numbers for our staff each game are OER and DER. These ratings give us an idea of just how efficient we were on both ends of the court." 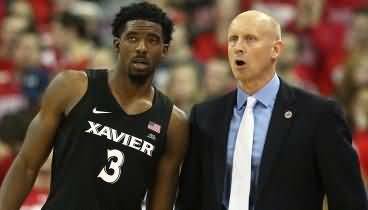 Calculating these numbers has been a part of Xavier's program for quite some time. They have kept an Excel spreadsheet to keep track of historical OER and DER data game-by-game and season-by-season... "It has proved to be a tremendous guide for us as we evaluate our team’s overall strengths and weaknesses." The formulas for calculating each are below. After calculating these numbers, it is important to understand what is good and what is bad. Below is a quick guide to understanding the results of these calculations. So assuming you have a statistician or two, you may find calculating this data helpful for your team. For example, by examining the formula, you can tell whether your poor OER is being caused by a low field goal percentage, or poor free-throw shooting, or too many turnovers.